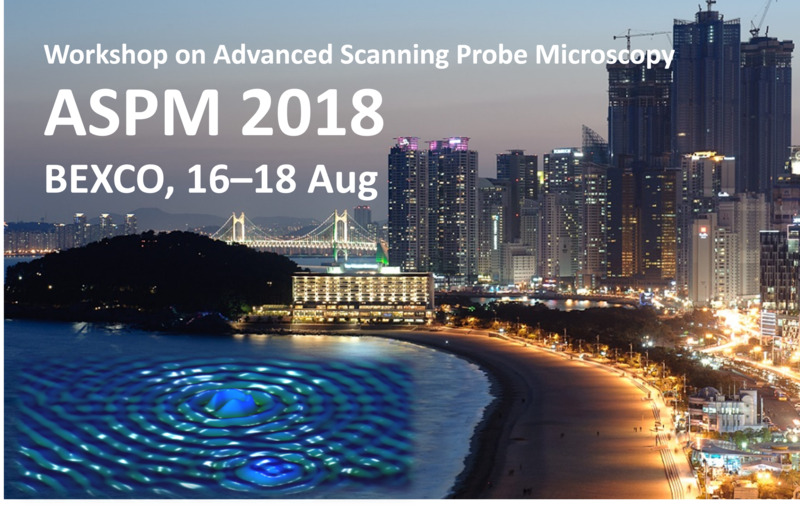 Workshop on “Advanced Scanning Probe Microscopy” (ASPM) 2018 will be held at BEXCO Haeundae Busan, Korea on Aug 16-18, 2018. Due to the great success of ASPM 2017 (https://www.aspm2017.com), it is apparent that ASPM has become a successful platform in Korea for sharing and exchanging the latest advances in science and technology using SPM. ASPM 2018 hopes to bring together scientists from a wide range of research fields at a single atomic and molecular scale. The workshop will address both fundamental science and cutting-edge technologies. ASPM 2018 aims for an innovative scientific workshop based on the lectures from local and international world class scientists. Additionally, ASPM 2018 also promotes a variety of contributed talks and poster presentations by the next generation of scientists in the field, such as students and young postdocs, to share their most progressive researches and fresh ideas. We are confident that your presence will add an important dimension to ASPM 2018. Please find more details on the scopes, organizations, and plans of ASPM 2018 enclosed below.